If you have ever seen your fingers twitch, you may wonder if it indicates a serious nerve condition. For some, yes. But for the majority of us, finger twitching episodes are harmless. In fact, your twitching may simply be caused by mental and physical stress. These incidents are more prevalent today with our extensive use of texting on smartphones. We will look at the hidden causes of twitchy fingers and possible ways to prevent the finger twitching occurrences. A finger twitch is an involuntary muscle spasm brought on by a localized muscle or muscle group connected by a single nerve. Our muscles tend to twitch when triggered by various factors. Let’s examine the most common finger twitch causes. Finger fatigue is a real thing, and it occurs with overuse of the muscles in our fingers. 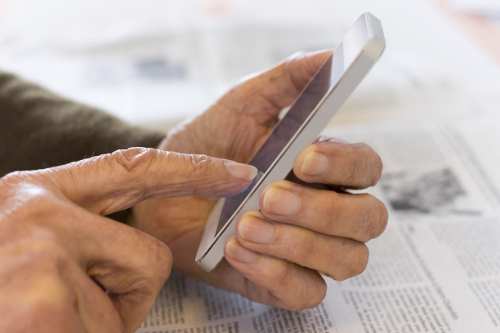 Whether it is confined to one finger or a few, the twitch can be brought on by muscle strain due to constant typing, texting, or playing hand-held video game devices. This condition sees pressure on the median nerve related to its overuse or repetitive motion. It can also result from compression on the nerve caused by a cyst, or ganglion, in the wrist. Patients may experience pain, weakness, numbness, and a burning sensation along with twitching. We depend on essential vitamins and minerals to maintain the good health of our nervous system. A lack of calcium and magnesium may cause twitching in the fingers. Our entire body requires proper hydration to maintain good health and functioning, and muscles are no exception. When there is a lack of fluids, we are at risk for electrolyte imbalance, which may cause twitching in finger muscles as well as other muscles in the body. Certain health conditions can trigger twitching such as metabolic disorders and the systemic diseases of kidney disease, low potassium, Parkinson’s disease, multiple sclerosis, myopathy, and Lou Gehrig’s disease. These directly affect the muscles, tendons, ligaments, blood vessels, tissue, skin, skin tissue, and bones. Finger twitching can be a common side effect of some medications. This is often seen with diuretics, corticosteroids, and estrogens. Some episodes of finger twitch can be seen with excessive consumption of coffee, tea, and other beverages containing caffeine. Those new to strenuous and/or weight-bearing exercises can also experience twitching of muscles. Because the twitching is a symptom of internal and external stimulants and conditions, there is no specific fingers twitch treatment. However, there are several non-medical options for you to try, which may help lessen or prevent episodes. These are some of the most recommended finger twitch home remedies for prevention. Ensure that you get adequate amounts of sleep each night as a lack of rest may cause the twitching of muscles. If you cannot get eight to 10 hours at night, try to take a nap when you can. Avoid stress whenever possible. In today’s world, that may be easier said than done, but it’s important to take time to settle your mind and body with yoga, walking, or sitting in a quiet environment for at least 15 minutes each day. Limit your intake of caffeinated beverages or foods such as coffee, soda, and even chocolate. The best thing is to avoid these products. Repetitive hand motions can trigger twitching and should be limited. If your occupation requires the use of your hands in such a manner, try to take frequent breaks. Be sure to get sufficient amounts of vitamins and minerals in your daily diet. Include foods high in vitamin D such as milk, eggs, and fish as well as foods with magnesium. These can be soybeans, flax, sunflower seeds, almonds, and bran products. Vitamin B-enriched foods like spinach, beans, peas, seeds, and nuts are also vital to a good diet to prevent twitching in fingers. It is important to exercise on a regular basis for good muscle health and overall well-being. Do not push or strain muscles during exercise, and try drinking two teaspoons of lime juice mixed with salt, sugar, and water after the workout. Many of us have experienced a sensation in our fingers that feels like a twitch or small tremor. An episode of finger twitch may lead you to wonder if it is a symptom of a neurological condition. Most times it is caused by muscle fatigue, repetitive motions, dehydration, or exercise. There is no need for treatment as the twitch usually dissipates. If the finger twitch is a symptom of an underlying health condition, your doctor may have treatment options for you that are specific to the disease or disorder. Upu, “What is the Cause of My Finger Twitching And How to Stop It?” Simple Remedies, June 20, 2012; http://www.simple-remedies.com/muscle-joints-bone-disorders/finger-twitching-causes-stop.html, last accessed May 19, 2017. “Muscle Twitching,” Medline Plus; https://medlineplus.gov/ency/article/003296.htm, last accessed May 19, 2017. Zinski, J., “How To Stop Finger and Palm Twitching,” eHow; http://www.ehow.com/how_8791202_stop-finger-palm-twitching.html, last accessed May 19, 2017.